With the release of iOS 9 last week, I was hoping YouTube would be ready with an app update to support Picture in Picture. As I suspected, though, YouTube hasn't brought iOS 9's improved video playback experience to their official app yet, and I wouldn't be surprised to know they're not thrilled to enable a floating video player that would make ads and annotations non-tappable. 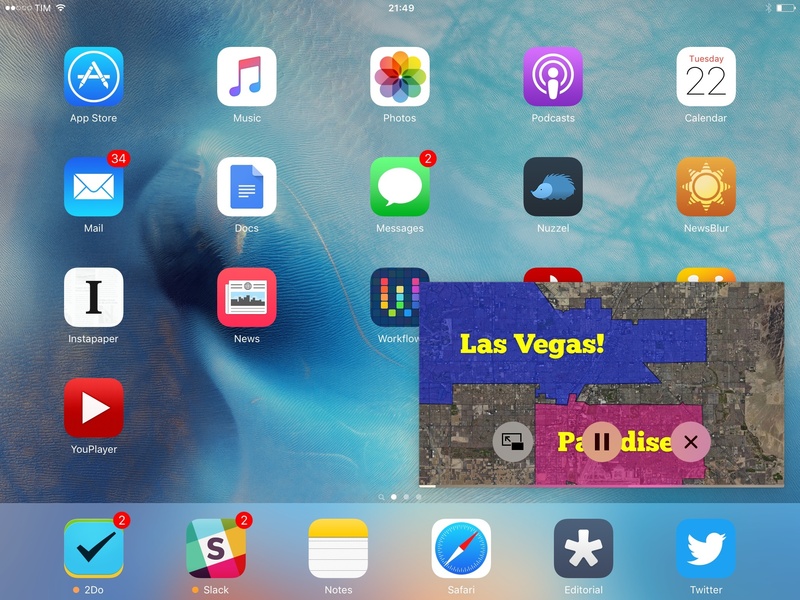 To overcome the lack of Picture in Picture for YouTube – a perfect use case for the feature, especially if you consider YouTube as a music player – I've started using YouPlayer, a free app by Homegrown Software that supports iOS 9 multitasking on iPad and, more importantly, Picture in Picture for all videos. Like other apps, YouPlayer is a third-party YouTube client. This means that you'll gain access to a subset of YouTube functionality and videos: in my tests, I've yet to come across a video that is exclusive to the YouTube app/website because of ads, but I'm sure I'll find one eventually. YouPlayer doesn't give you full access to account management tools and browsing options found in official YouTube offerings: you can view and manage your subscriptions, like videos, and leave comments, but you can't view all the account information and settings you'd normally get in the YouTube app. Because of its third-party nature, however, YouPlayer is able to implement features that YouTube has long omitted from its iOS app. You can permanently set the default quality of videos to 720p (no 1080p or 4K options here), and you can also change it on an individual basis with a button in the video page. Tapping the share icon goes directly to the share sheet, allowing you to share a video's link with native extensions. You can even tap & hold videos in search results and other views to add one to your Watch Later queue, favorites, or a playlist. YouPlayer lacks many of the options and controls that are exposed by official YouTube products, but it is surprisingly versatile and it has shortcuts and system integrations that make sense on iOS. One of these is Picture in Picture, which has allowed me to watch YouTube videos while doing something else in other apps. Thanks to the standard iOS video player it uses, YouPlayer offers a button to shrink a video down to Picture in Picture format, which will follow you around while playing in the background. If you watch a lot of YouTube videos on a daily basis like I do, this is a small dream come true: videos don't often require my full attention, but YouTube forces me to stay within the app if I want to keep watching. iOS 9's Picture in Picture is a perfect candidate for YouTube videos, and YouPlayer makes good use of the technology and other iOS features to provide a nimble, consistent YouTube experience. Whenever I find a YouTube link I want to watch, I can copy it, open YouPlayer, and the app will identify it, offering me to open the video and watch it. Then, I can tap the Picture in Picture button, exit the app, and return to what I was doing. If I want to share a video, I don't have to go through YouTube's custom share menu – I can use the share sheet with all my extensions in YouPlayer. I don't know if YouTube will clamp down on unofficial clients such as YouPlayer, but the experience I've had in the past week with this app is superior for iOS 9 users in almost every way. 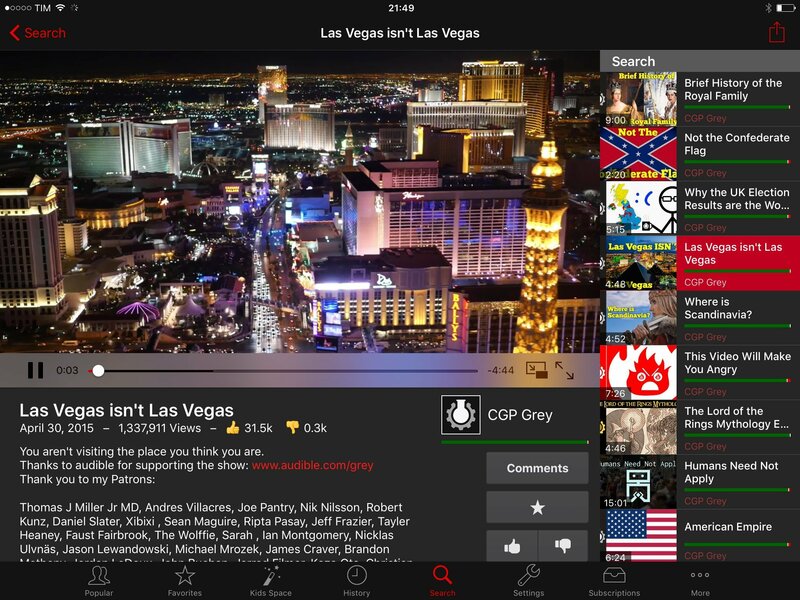 YouPlayer is a capable client with great touches such as a dark mode, native iOS sharing options and playback, and shortcuts that make playback and browsing more intuitive. There's a $1.99 In-App Purchase to disable ads and enable a Kids Space mode – I haven't used the latter, but I bought the IAP to remove ads and support the developer. I've used YouPlayer for search, subscriptions, sharing, Picture in Picture, and more – and I haven't missed the YouTube app (which I also uninstalled last week). I'm still hoping that YouTube will consider iOS 9 features like multitasking and Picture in Picture, and I'll try the app again when that day comes. Right now, YouPlayer brings the YouTube experience I want on iOS 9, and it's free on the App Store.